The Skinny: Believe everything you've heard: Shaolin Soccer is a terrific Hong Kong movie. After a two-year hiatus, Stephen Chow finally returned to Hong Kong screens with Shaolin Soccer. Easily his most ambitious film, it combined the usual Chow moleitau nonsense comedy with a sports storyline and special effects. The result: the biggest local moneymaker in Hong Kong history, and a critically-lauded effort which took home Hong Kong Film Awards for Best Picture, Director, Actor and a bunch of others. Chow stars as Sing, a Shaolin disciple famed for his "Mighty Steel Leg". He's inspired to start a soccer team composed of Shaolin martial artists after he meets Fung (Ng Man-Tat). Fung was once a brilliant soccer player called "Golden Leg Fung", but he became crippled after throwing a match some twenty years ago. His rival Hung (Patrick Tse) was the cause of Fung's injury, and now leads an intimidating soccer team with the unsubtle moniker "Evil Team". Fung's goal is to meet his old rival on the playing field, but first they have to get a team together. To recount the rest of the plot risks overkill. Shaolin Soccer has immeasurable buzz attached to it, mostly due to its impending US release courtesy of Miramax/Dimension films. It's well-deserved buzz, but it makes talking about the plot unnecessary. Buzz is all about one thing: is this movie good? And yeah, Shaolin Soccer most definitely is good. If it were really bad, then no one would be talking about it. Still, the film isn't perfect as it takes a little too long to get going. Fans of Stephen Chow will most likely be hooked from frame one, as the film is chock-full of his pet themes and trademark sense of humor. However, the uninitiated might find the first hour slow. Fung and Sing first have to decide to play soccer. Then they have to assemble their motley band of Shaolin soccer players. Then they have to train them. Then they have to regain their confidence. Watching all this happen is necessary and involving, but it also gives way to lots of nonsensical antics that can tax the patience of the uninitiated. However, when the film hits the hour mark, everything falls into place. Once Sing and his Shaolin brothers take to the soccer field, all the elements come together in a vividly original and exciting mix of Stephen Chow comedy, sports-film clichés, Chinese cultural oddities, and simply cool special effects. It's inevitably the soccer scenes that make converts of those unused to Chow's body of work. But do forty-five minutes of ultra-cool soccer sequences earn a film such insane amounts of praise? One might wonder why Stephen Chow was given a Best Director, Best Actor and Best Picture award for Shaolin Soccer as it doesn't really deviate from his tried-and-true formulas. The film has common themes with Love on Delivery and God of Cookery, and Chow's string of hits during the nineties has made HK audiences very accepting of his particular brand of comedy. 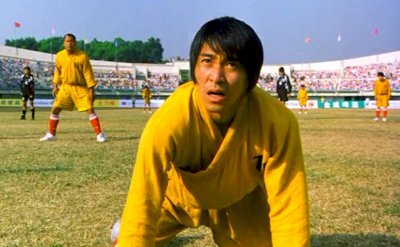 Some might even say that Shaolin Soccer is just another Stephen Chow movie. Well, it is another Stephen Chow movie. But it's also plenty more than that. What makes the movie such an achievement is the fact that it both reflects and reinvents Hong Kong Cinema in startlingly successful ways. The film features the same "root for the underdog" attitude that made Chow a superstar in All for the Winner. Chow's deadpan comic delivery and precise physical comedy are present. And the Shaolin martial arts gags and references have a rich history in Hong Kong film. But the special effects are brand-spanking new. The central plot of soccer is a globally relevant one. Some of the best visual gags are drawn from the world of video games and Japanese animation. And the film is specifically constructed like a sports film with a fully realized set of themes. Shaolin Soccer is the result of an unusual amount of planning and production, but it also directly reflects the sensibilities of its Hong Kong creators. It becomes both personal and commercial, local and global, and even funny and serious. Shaolin Soccer is a classic "underdog makes good" story. Down and out Sing (Stephen Chow) starts a martial arts soccer team after meeting Fung (Ng Man-Tat), who used to be a star Soccer player. Fung was left crippled years earlier by Hung (Patrick Tse) who now heads the unbeatable "Evil Team." Fung and Sing recruit Sing's former kung-fu school brothers and form a very pathetic-looking team whose goal is to eventually defeat the Evil Team. Though Stephen Chow stars in the film, his character is really just a catalyst. Fung is actually the emotional center of the film. Sing is simply a vanity role for Stephen Chow; he just kicks the ball around with his "Mighty Steel Leg" and looks cool most of the time. About halfway through the film we are provided with the setup for a character arc which is never delivered. Chow also served as director, so it's interesting that he gave the supporting cast so much attention and seems to have neglected his own role. image courtesy of Universe Laser and Video Co., Ltd.